VarCity Apparel has made several posts regarding the importance of the month of October, and that it signifies breast cancer awareness month. While October is drawing to a close, the fight continues on! The NFL program A Crucial Catch has been one of the most infamous programs, with the entire league accenting uniforms in shades of bright pink printed in t shirts. This idea was what originally inspired Brian Mucha and Lincoln Middle School to start something similar. “We saw [the game] as a win-win situation because it was something different and fun for the students and it also raised awareness to an important cause,” Mucha said. 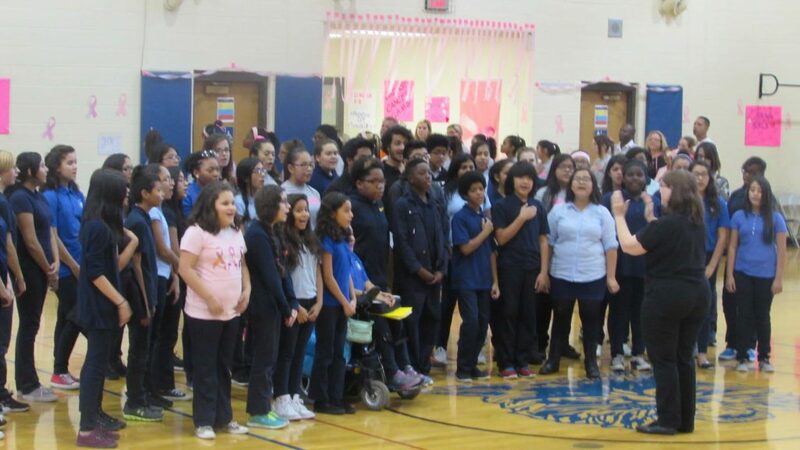 Lincoln Middle School is located in Berwyn, IL, surrounded by several other middle schools within a 5-mile radius of one another. Each year, the middle-schoolers compete in school sports. The majority of the basketball season is during October, with two match-ups between schools per season. “The sports between the schools are very competitive and we thought the girls’ basketball teams would love wearing some sort of pink t-shirt jerseys while raising awareness for Breast Cancer for the game,” Mucha said. Mucha explained the Breast Cancer Awareness Game started by asking their rival school Unity Junior High in Cicero if they wanted to have a Breast Cancer Game at each school. Each team would get to make their own t-shirts printed for the game. “For [Lincoln], our mascot is a Wildcat,” Mucha said when explaining the inspiration behind the printed t shirts. 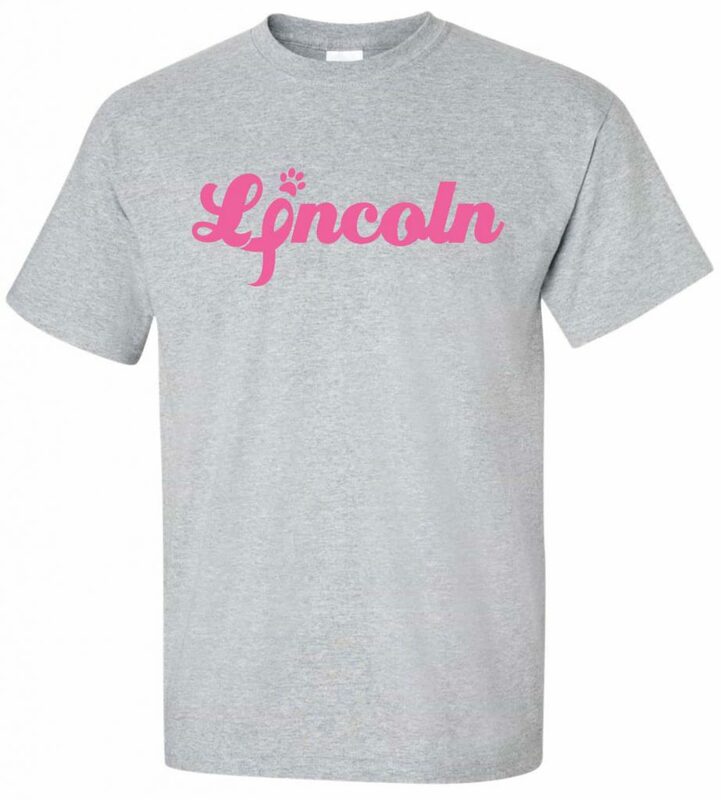 “We used the breast cancer logo for the “I” in LINCOLN and then we put a logo of a paw to dot the “I”,” Mucha said. Mucha explained that the sale was opened up to the entire school community and all proceeds from the t-shirts were donated to breast cancer research. 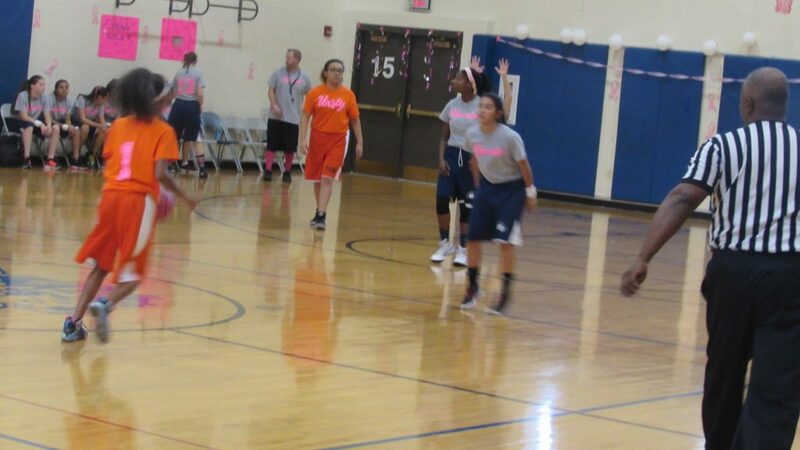 3 years since picking up on the pink trend and the Breast Cancer Awareness game is in its third year. Four schools in Lincoln Middle School’s conference have bought the t-shirts and all wear them during the matches, according to Mucha. They have been switching the designs to keep things unique from year to year! But the game has also evolved into a night of multiple activities. Admission is free with a purchase of a t-shirt, and donation jars are placed at entryways for direct donations. Mucha said they had attendance around 300 people (which is a lot for a middle school!) and had to make a large order of concessions to be sold by the Pep Club during the game. The team plays with pink basketballs, pink nets, with Breast Cancer logos, Breast Cancer Balloons, and student-made pink posters and banners all around the gymnasium to create “an electric atmosphere.” The night features a 3-point shot contest, and anyone could enter for .50 cents. 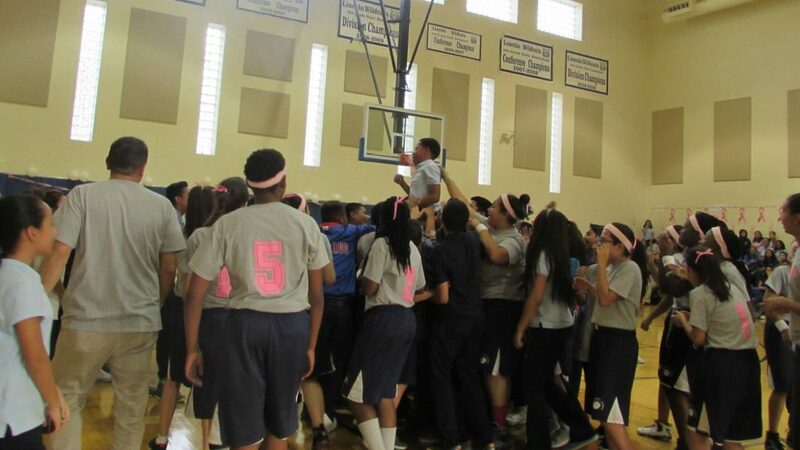 There were over 180 contestants and winners received a mini pink basketball with the Lincoln Wildcats logo. Before the real game begins, Lincoln Middle School’s choir comes out to sing the National Anthem. During half-time of the first game, Mucha explained there was a half-court shot competition to win 2 Lexus Club Chicago Bulls Tickets, courtesy of VarCity Apparel. “After about 60 people shot and missed we had an eighth-grade boy who hit the shot and the crowd went nuts,” Mucha said. “[The students] actually picked him up like in the movie Rudy. It was such a great moment for him and for the game.” At half-time of the second game, people shoot half-court again for the mini basketballs for $0.50. “In the end, we raised over $1,700.00,” Mucha said. At the conclusion of another successful year, Mucha says they want to continue making it an annual event. Not only that but getting all twelve teams in the school’s conference to participate in the event. Though the biggest goal for next year’s event is to bring in Breast Cancer survivors and “honor them at our game,” according to Mucha. We’re excited to see what you guys do next year, Lincoln Wildcats! Keep up the amazing work you guys do to raise awareness on this potentially life-threatening disease. VarCity in Chicago provides t-shirt printing services for all occasions in the US.